Handwritten character sheets can get messy after a few gaming sessions, sometimes I like to start fresh with a type-written character sheet. I don’t generally use proprietary software, and in any case spending lots of money on some Adobe software is not worth it for me just to edit non-fillable PDF documents. If you use GNU/Linux, there is a solution – flpsed. Flpsed is a nifty piece of free software that allows you to overlay text onto postscript documents. What really makes it useful is a PDF import/export feature. 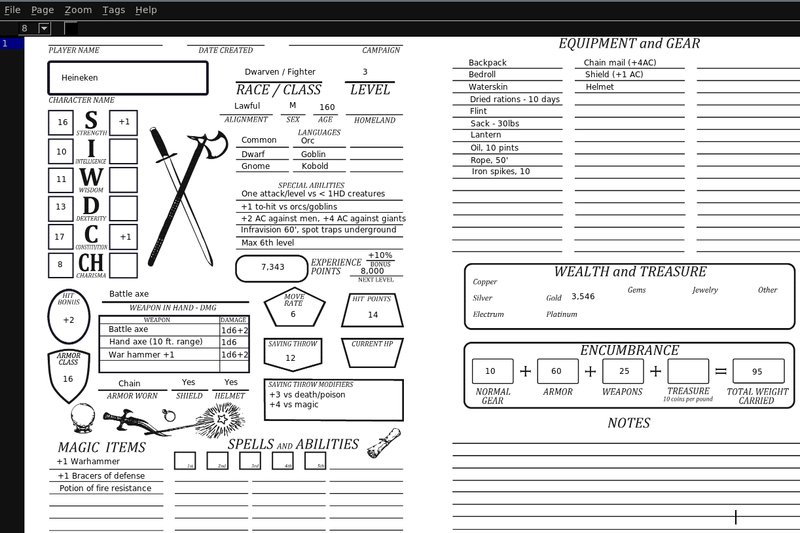 The idea is to import your blank PDF character sheet, add text wherever you like, then either print directly from flpsed, or export to PDF and print that via a standard PDF viewer. Here is what it looks like with a completed character sheet (this is one of my son’s S&W Whitebox characters). Adding text is just a matter of clicking on the document and typing. A box will surround the text as you type. When in this input mode, using the arrow keys will move the text box around in small increments, so you can position it wherever you like. Existing text can be edited by clicking on the text itself, when the box appears, you can edit what is inside it. On Debian or Ubuntu Linux, you can install flpsed via a graphical package manager (Ubuntu Software Center or synaptic on Debian), or ‘apt-get install flpsed’ as root (use ‘sudo apt-get install flpsed’ on Ubuntu). Note that this doesn’t make the PDF itself editable – it just allows you to add text to a non-fillable PDF document. But I’ve found it pretty useful for gaming.